The winter months are a great time to enjoy root vegetables. Not only are they now in season, but they are healthy, delicious, and they keep well. In addition, they are often inexpensive, and are loaded with nutrients. Not sure what counts as 'root vegetables'? Basically, these are any vegetable that grows underground. Examples include: yams, beets, parsnips, turnips, rutabagas, carrots, sweet potato, yuca, kohlrabi, onions, garlic, celery root (or celeriac), horseradish, daikon, turmeric, jicama, Jerusalem artichokes, radishes, and ginger. Because these vegetables grow underground, they absorb a lot of nutrients from the soil. They are packed with a high concentration of antioxidants, Vitamins C, B, A, and iron, helping to cleanse your system. They are also low in calories. While delicious and healthy, do bear in mind that root vegetables are high in carbohydrates. "They are so high in carbohydrates that they are more like grains than greens. It makes more sense to put them in the same category as breads, rice, or pasta," says dietitian Teresa Fung, adjunct professor in the nutrition department at the Harvard T.H. Chan School of Public Health. The flesh of a medium baked sweet potato has only 103 calories and enough vitamin A to meet your entire Recommended Dietary Allowance for the day (for adults 51 or older, that's 700 mcg for women, 900 mcg for men). A cup of mashed turnips has 51 calories and 76 milligrams (mg) of calcium — as much calcium as half of a slice of cheddar cheese. A medium baked russet potato (including its skin) has 164 calories and 935 mg of potassium (more than twice the potassium of a medium-sized banana). 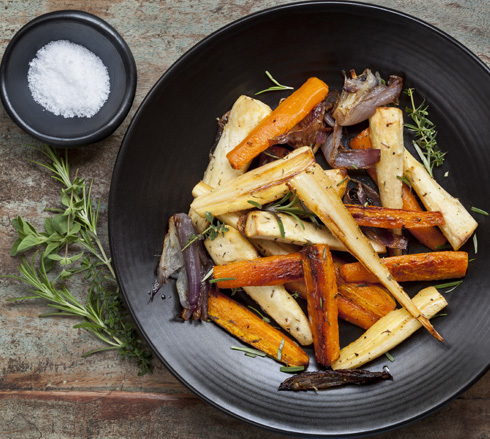 Root vegetables can be prepared many ways - they are delicious roasted, grilled, or braised. They can also be made into soups, gratins, hash browns, fries, or root vegetable chips! Give them a shot - they are easy to cook and well worth a try!